Learn about Tunica, Mississippi by reading Tunica - A Delta Delight by Charlie Spence, Travel Writer. It features a mini, but thorough tour of the destination, plus all you'll need to know to plan your trip including getting there, objective information on places to stay and eat, and things to do. At the end of the article, we've provided a summary of the contact information for your easy reference. Enjoy! When you set out to visit Tunica, you are actually going to two destinations: an historic community with southern charm and the South’s casino capital, the largest casino resort between Las Vegas and Atlantic City. This destination in the northwest section of Mississippi has become the new hot spot for golf, tennis, history, heritage, entertainment and the plea for “luck be a lady tonight.” On the Mississippi Delta, Tunica is in the heart of where “The Blues” was born. It’s just south of Memphis, Tennessee - less than 20 miles - and now attracts more than 10 million visitors a year. A quick look at the new developments shows why. A $26 million River Park and Museum attraction was opened in 2004. Overlooking the Mississippi River, River Park has exhibits focusing on history of the river, early explorers, and the levee system. Many of the exhibits are interactive. Or, if you want to have a lazy rest, just sit in one of the rocking chairs on the covered porch and look out over the Mississippi and imagine you see Mark Twain captaining an old paddlewheel boat. (Maybe you just did that yourself in the park’s pilothouse simulator.) Of course, all this is just to get you ready for a river excursion on the 300-passenger Tunica Queen. The open-air top deck lets you have a great panoramic view of the Mississippi. For a delightful evening take one of the Queen’s dinner cruises and enjoy an array of Southern-style cuisine. At about the same time the River Park opened, so did the Tunica Golf and Tennis Club, presenting a golf-training academy, a par-72 championship course designed by Mark McCumber, and the South’s only Hydro-Grid Har-Tru clay tennis courts. Let the Golf Training Academy diagnose your swing and then help you through a specific training program to improve your game. Each of the hitting bays is equipped with three cameras that can record practice sessions and provide detailed analysis of your swing. 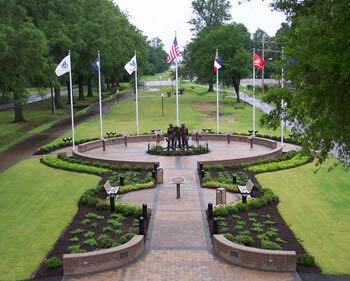 Veterans’ Memorial Park honors those veterans who lost their lives in wars. History buffs will want to spend time in downtown Tunica. Quietly walk around the Veterans’ Memorial Park, which honors the persons of all branches of military service who lost their lives in wars plus those lost in the 9-11 terrorist attack. 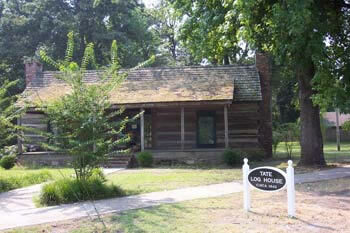 Then drop over to the Tate Log House Museum, the oldest existing structure in Tunica County. 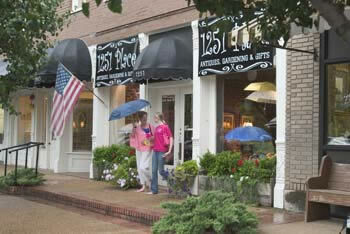 You will also find numerous antique shops for browsing and shopping. In this heart of the blues country you would expect to find a place to honor the greats of this style of music. Sure enough, one casino has the “Blues and Legends Hall of Fame.” Listen to the music as you browse the guitar and harmonic collections and watch the videos of the Delta’s famous blues entertainers. As if all this is not enough to entice you, just a few miles either direction from Tunica are other places of interest to add to your pleasure if you have the time and inclination to move on. A few miles north is Graceland, the home and resting place of Elvis. You can see his automobile collection, his private jets, and the Meditation Garden. Only a short drive south of Tunica is Clarksdale, the home of many blues legends such as W. C. Handy and Muddy Waters. Whatever your preference in seeking new and different places, when you head for Tunica, you’re on a winning streak. Tunica has an excellent airport that welcomes visitors. Pan Am Airways offers service to and from Atlanta. The airport is close to downtown Tunica. Memphis is but about 20 miles north of the area and has a multitude of airline services. Driving is but a few hours away from much of the Mississippi Valley. You can check rates and book your room and rental car using WTA’s Online Travel Booking Service. Significant savings on hotel rates may apply. Each casino has a selection of restaurants and there are the usual fast food places in the area including Wendy’s, KFC, Subway,. and others. Other restaurants are in downtown Tunica.Try the Blue & White in downtown for a real taste of southern fare. This is reportedly one of the best of its kind along the Mississippi delta. Try its noon buffet. Notice: This information is current as of May 2006. It is recommended that you contact the numbers, and/or visit the web sites above to determine any changes to the information.